It looked and felt like spring yesterday, so after working a few hours in the morning, teaching a photography class, I decided to take advantage of the nice sunny day to take a photographic road trip. 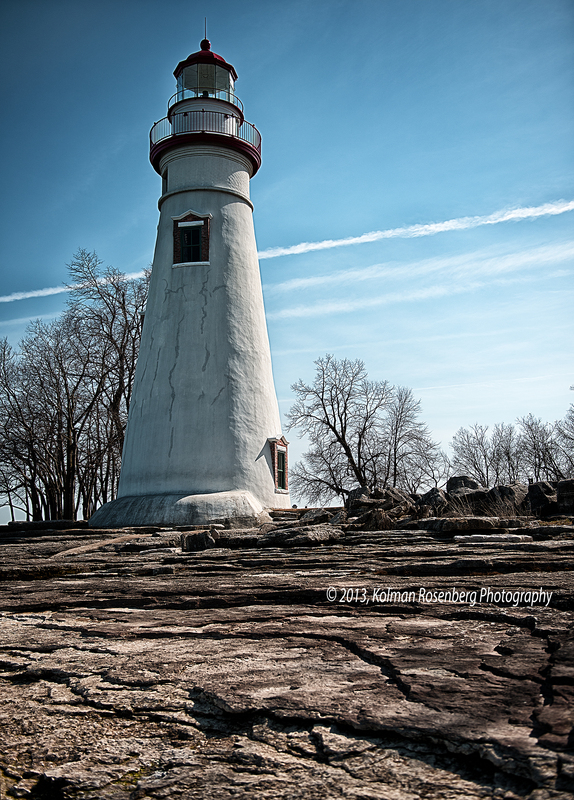 I’ve been up in Marblehead, OH on a few occasions to photograph this lighthouse but the weather conditions were never very suitable for a nice photo. Yesterday the sky was mostly clear, although cloudy in the Cleveland area when I left, and the temperature was in the high 50s. It finally felt like spring! I think I’ve said before that I usually look for photos that others have not taken. Once at the lighthouse I did take the some of the same shots that everybody else takes, but then I walked all around the grounds looking for the unusual shots. The shot above was an angle I had not seen before. 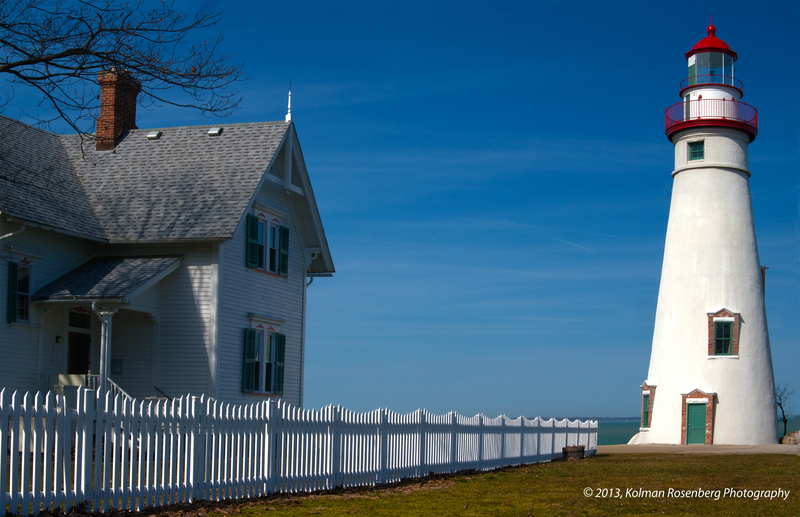 With the keepers house on the left, the fence leads right to the lighthouse, leading the viewer’s eye from left to right diagonally across the photo. I would have preferred a little less empty sky in the middle but did not have the power to change that while still keeping the angle of the fence. This second shot was taken by climbing down the rocks at water’s edge. It was not a difficult climb, almost like steps, and many other tourists were climbing all over the rocks as well. I found myself often having to wait for many minutes for a clear shot without people in the frame. I shot at a low angle in order to emphasize the layers of rock leading up from the edge of Lake Erie to the base of the lighthouse. I’m sure this is not an entirely unique photo. It was easy enough to take. I’ve seen similar photos of lighthouses in Maine. Tomorrow there is snow in the forecast again, so I’m glad I took the opportunity to take my road trip! It seems like it’s going to take spring more time to finally get here and I’m getting tired of waiting! This entry was posted in Uncategorized and tagged island, lake, Lake Erie, lighthouse, Marblehead, OH, ohio, perspective, Photo, roadtrip, sky, Spring, sun, tour, tourist, unique, Weather. Bookmark the permalink. 4 Responses to Is It Spring Yet? Kolman, I look forward to your posts. I always learn something. These are lovely. You have connections, perhaps someone you know has a photograph of the old Dairymen’s milk sign. It was along the shoreway and poured milk from the bottle into the glass. I am thinking I would like to have one. Hi Patricia! I’ll put out an inquiry to my photography friends and see if anyone has a photo of that sign! I’m glad you enjoy the blog! Thanks for the comment and thanks for following it! Kolman, I love those rocks! Lighthouses don’t especially move me, but the rocks make this, for me, a compelling picture. I want to climb to the top to see what’s on the other side. Thanks for your comment Lenore! The rocks are very interesting. When wet they are very slippery, but on this day the water was calm and the rocks were dry making it possible to get right down by the water! Have you been up to Marblehead? It has rocks all around it for about 270 degrees!